As most people are aware, many major health problems can be linked to poor nutrition, including heart disease, diabetes, obesity, tooth decay, and osteoporosis. And, these problems aren’t limited to a small number of people: According to the CDC, about half of all American adults have one or more preventable chronic diseases, many of which are related to poor eating habits. Because of these health risks, it’s no surprise that individuals often turn to nutritionists and dietitians to help improve their nutrition and wellness. Employment of dietitians and nutritionists is expected to grow 15% by 2026, which is much faster than the national average for all occupations (7%). If you’re currently employed in heathcare or a health-related field and are interested in careers in food and nutrition or nutrition and dietetics, you may consider earning a master’s degree in nutrition to better position yourself for a role in this quickly growing field, and to gain a deeper knowledge of the complex relationship between nutrition, community, and health. What Can You Do with a Master’s in Nutrition? A master’s in nutrition can open doors to a wide range of career opportunities. Below are examples of popular nutrition and wellness career paths and their associated salaries. Dietitians offer health advice and develop personalized nutritional plans for anyone who may need guidance, including individuals with medical conditions that require a certain diet, people who want to lose weight, or those training for their career or a special event. It is important to note that these professionals may only refer to themselves as Registered Dietitians (RDs) once they have earned the RD credential from the Commission on Dietetic Registration (CDR), which includes completing a dietetic internship and passing the dietetic registration exam. Even current RDs may strongly consider earning a master’s degree in nutrition, as the CDR will soon require a master’s degree to continue practicing. Nutritionists often perform the same work as registered dieticians, but they are not registered with the CDR and in most cases may not work in hospitals or clinics. However, many states still have strict requirements for those offering nutrition counseling. Because many nutritionists are self-employed, they often have the freedom to choose their own clients and set their own work hours. Nutritionists may also be health consultants for businesses or work as sports nutritionists for collegiate or professional teams. Some nutritionists even supplement their income by writing for health publications or contributing to other media outlets. Given how much food and drugs impact our daily lives—and how strictly they must be regulated—there are myriad opportunities for nutrition professionals in business or industry roles including research, quality control, sales, marketing, and public relations. Researchers, for example, may conduct studies to ensure pharmaceuticals and foods are safe for consumers and meet regulations while quality control professionals may oversee the safety and quality of goods from production to distribution. Nutrition Industry Salary: Varies depending on industry, location, and level of experience. Quality Assurance Managers in food manufacturing earn an average of $75,899. Pharmaceutical Project Managers earn an average of $88,150. While dietitians and nutritionists may work in the public health sector, there are many other opportunities available to nutrition professionals in hospitals, medical associations, and public health departments at the city, county, and state levels. Depending on the position, these professionals may conduct research to advance scientific knowledge of nutrition and dietetics, as well as promote good health and disease prevention. Public Health Job Salary: Varies depending on position, location, and level of experience. Public Health Administrators, for instance, earn an average of $65,321, while some report earning more than $90,000. Public Health Specialists, on the other hand, earn an average of $48,562 and may earn as much as $70,000. Many nutrition professionals have a passion for sharing their knowledge and expertise to make an impact on a wider number of people than they would as a private practitioner. These nutrition educators promote good health by creating and implementing nutrtition education services for hospital patients, home care patients, outpatients, and other groups of people in their community. Other nutrition educators may decide to teach the next generation of nutritionists and dietitians at the community college level. While most four-year universities require a Ph.D., many community colleges and junior colleges allow qualified individuals with a master’s degree to conduct research and develop and teach a range of nutrition courses. Nutritional Educator Salary: Varies depending on position, location, and level of experience. Postsecondary teachers, on average, earn $76,000 per year. Nutritional Educators in New York City earn an average of $54,871. No matter which nutritional career path interests you, the online M.S. 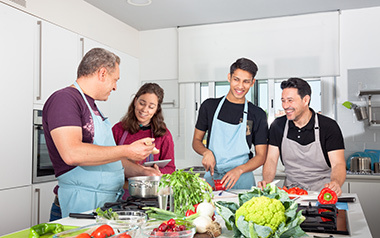 in Nutrition can help you achieve your goals by providing a streamlined curriculum concentrating on the skills and knowledge that both reflect the latest nutrition science research and align with current career opportunities. The program is geared toward busy working professionals in health or health-related fields who want to expand their knowledge so that they can more effectively help others and/or earn a professional credential that is required for employment or career advancement.